Mark's Tickets is the best place to find tickets for Los Angeles Rams fans. Just check this page for any new events or schedule updates throughout the year. We sell tickets to every Los Angeles Rams game around the world. 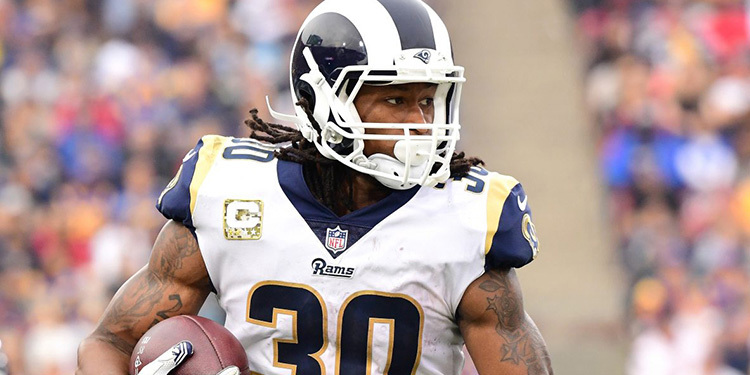 We know how passionate Los Angeles Rams fans can be about football, so we make sure to have hundreds of tickets for every game available right up until it starts. For those looking for cheap Los Angeles Rams tickets, we offer tickets starting at very low prices (many times below face value). We offer tickets in most sections of every venue that you can see Los Angeles Rams. Simply choose the city or venue that you are interested in below, and you will be able to see all of the available seats. Do not forget that Marks Tickets also specializes in sold out Los Angeles Rams tickets. No longer will sold out shows prevent you from seeing Los Angeles Rams. The St. Louis Rams are a professional football team that plays in the NFL. The Rams play their home games at Edward Jones Dome in St. Louis, Missouri. With 16 games per year, and 8 being home games, The St. Louis Rams are a professional American football team based in St. Louis, Missouri. They are currently members of the West Division of the National Football Conference (NFC) in the National Football League (NFL). The Rams have won three NFL Championships (two pre-merger, and one Super Bowl), and are the only NFL team to win championships in three different cities (Cleveland, Los Angeles, and St. Louis). The Rams began playing in 1936 in Cleveland, Ohio. The NFL considers the franchise as a second incarnation of the previous Cleveland Rams team that was a charter member of the second American Football League. Although the NFL granted membership to the same owner, the NFL considers it a separate entity since only four of the players (William "Bud" Cooper, Harry "The Horse" Mattos, Stan Pincura, and Mike Sebastian) and none of the team's management joined the new NFL team. The team then became known as the Los Angeles Rams after the club moved to Los Angeles, California, in 1946, opting not to compete with Paul Brown's Cleveland Browns of the All-America Football Conference. Following the 1979 season, the Rams moved south to the suburbs in nearby Orange County, playing their home games at Anaheim Stadium in Anaheim for fifteen seasons (1980?94), keeping the Los Angeles name. The club moved east to St. Louis prior to the 1995 season.